Enjoy a great day out walking! Our guides to the best mountain and valley walks in the Lakes include walks for all abilities and fitness. If you have limited vision follow this link. You'll find information on ways to enjoy the Lakes. Welcome to your personal and friendly guide to the English Lake District! Use the menus in the left and right columns to navigate around the site. Please send us feedback on accommodation, events, and any other items of interest! Where would you go if you wanted to see the classic Lakeland view, the one that sums up everything about the English Lakes? Or if you were buying outdoor gear, where would you go for great personal service and advice - from experts who really know what they're talking about? What about eating out? Who's in and who's out of fashion? Where can you go for the best pub food? Or an exquisite gourmet treat? And how can you find the most comfortable and enjoyable accommodation - the place to stay that exactly suits you and your needs? You'd like a romantic weekend away or you just have to have king-size beds? No problem! We have the answers to these and all your other questions - saving you hours looking around, avoiding disappointment, and simply giving you the best holiday experience you can have! The Lakes attracts many thousands of people every year, yet the region retains its beauty, charm and tranquillity. You can easily find yourself alone among some of the finest mountain scenery in Europe, or you can explore the beautiful valleys and little towns with a host of exciting restaurants, cafes, shops and galleries. See David Paginton's Photos Here! 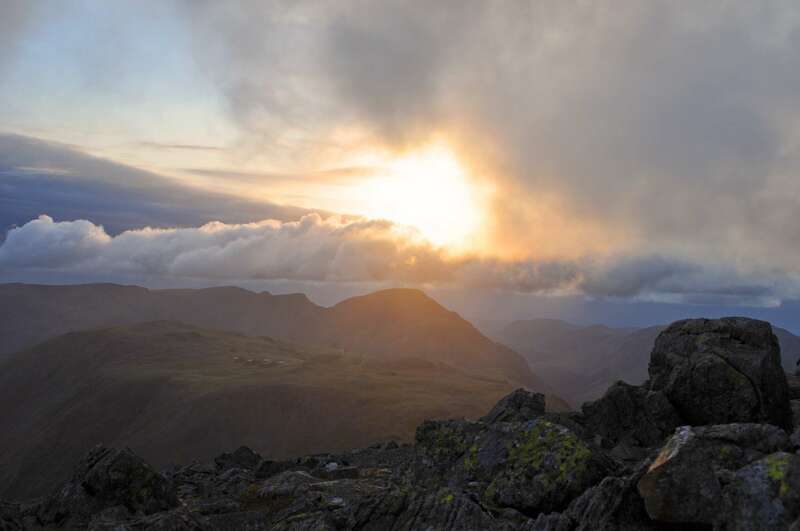 Whether you want to trek the high passes of the Lakeland mountains, take a weekend break, or plan a fun day out, we can give you the ideas you need to make any Lakeland trip a rip-roaring success! You can choose where to go in the Lakes - and, of course, on this website - by clicking on one of the links in the left hand column, or you can take a short cut to see our favourite Lake District places and pastimes in our exciting, handy and time-saving "Top Ten" feature to the right of this page. Great Gable on the 19th May, overlooking Kirk Fell and Pillar in the background. Click on the picture to see the full size version! Many of the images at the top of the pages on this website are from Andrew Leaney's website: www.leaney.org This is a highly enjoyable website with many of Andrew's walks and photographs. And drone photography seems to be increasingly popular - look at this - droneybee.com for aerial photography - amazing! Thinking of a holiday in Devon? Lakes walks can be found here. You can also go here for many more Lake District walks. And some great mountain walks are described here. A collection of walks in the Lakes, taking you o'er dale and hill. What we think might be the most enjoyable, impressive or entertaining attractions in the Lakes! If you need a massage therapist, counsellor, psychotherapist, or any other kind of complementary therapist, this is a listing of what the Lakes has to offer. Amazing photography that sums up the timeless beauty & essential spirit of the English Lake District.